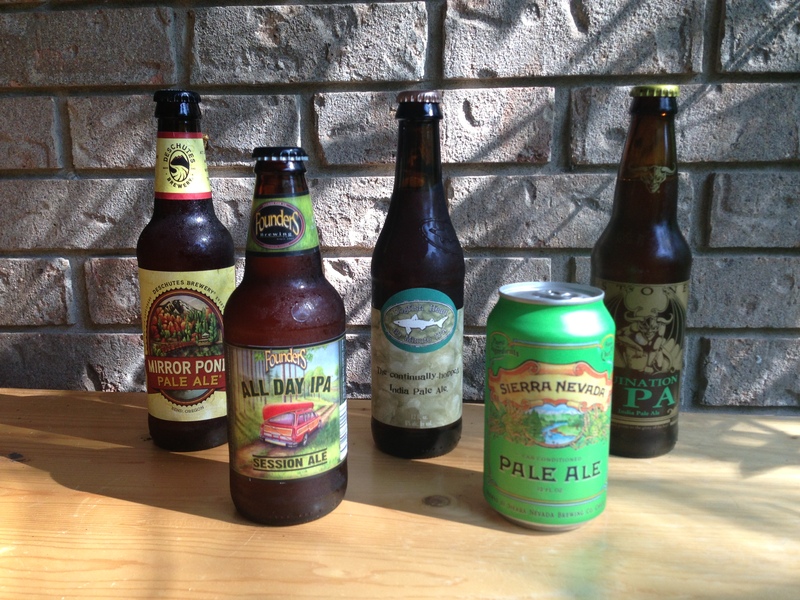 A range of American hoppy ales. Making a fermentable wort is key to producing these hop-forward beers. This is the fourth installment in a series on American hoppy ales. The first article was posted on July 28. When brewing an American pale ale, IPA or double IPA (dIPA), fermentability is very important. All three of these American hoppy ales are showcases for hops and the beer should be sufficiently dry so as not to obscure them. In sweeter beers, and beers with fuller mouthfeels, the hop character is dulled and so this is avoided in American hoppy ales. Wort fermentability is achieved through two means — recipe formulation and wort production. In the article on grists for hoppy beers, we saw that as you moved up the “ladder” from American pale ale to IPA to dIPA, less crystal malt was used. Wort made with higher percentages of crystal malt shows a lower degree of fermentability, all other things being equal, so it’s use is kept in check in American hoppy ales. In addition, the fermentability of some dIPA worts is increased by swapping sugar for a percentage (5–10%) of the pale malt. So, in general — although it is easy to find exceptions — as you move up in original gravity (OG), the final gravity (FG) does not increase at a proportional pace, because wort fermentability increases. Wort production in an all-grain American pale ale is very straightforward. 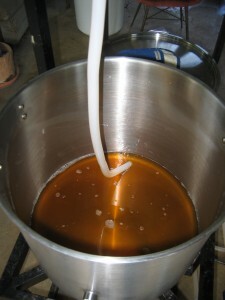 You want to make a wort with a reasonably high level of wort fermentability. The beer should not be bone dry, but it shouldn’t be sweet either. For most brewers, a single infusion mash in the 150–152 °F (66–67 °C) range works well, but higher mash temperatures (up to 154 °F/68 °C) are not that uncommon. Given a typical pale ale grist, with about 10% crystal malt, this gives a middle-of-the-road to slightly high level of fermentability, which is perfect for an American pale ale. The starting gravity of these beers isn’t that high, so the fermentability and the usually attenuation of American ales strains should yield a final gravity around 1.012. (The BJCP gives 1.010–1.015 as the acceptable range.) Overall, the plan for an American pale ale is to tilt things slightly in the hops favor, but don’t go nuts on any particular aspect. Don’t absolutely minimize crystal malt. Don’t mash for excessively high fermentability. Don’t go for the most hop-favoring chloride to sulfate ratio. And, as we’ll see later, don’t go completely overboard on the hops. US 2-row pale malt is very enzymatic. Most homebrew recipes specify mashing for 60 minutes. This will work fine for an American pale ale, but keep in mind that your starches may be fully converted in 20 minutes. If you perform an iodine test and it’s negative (no starch detected), don’t be afraid to mash out (to 168 °F/76 °C), start recirculating and proceed to wort collection. 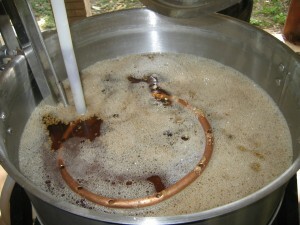 A pale ale being mashed. Wort production for an American IPA can also be very straightforward. You want to wort to be somewhat more fermentable than a pale ale wort, but not by leaps and bounds. Also, given that most IPAs contain less crystal malt than most pale ales, they already are set to produce a slightly more fermentable wort. In most cases, a single infusion mash in the 148–150 °F (64–66 °C) range will work fine, although again higher temperatures (up to 152 °F/67 °C) are far from unheard of. Although you could mash out and start recirculating, in preparation to run off the wort, as soon as you get a negative iodine test, letting the mash rest a bit longer gives the enzymes a little more time to work, increasing wort fermentability. (Longer rests also yield higher extract efficiencies.) A 60-minute mash — stirred as frequently as is reasonable (and that won’t result in significant heat loss) — will work well for an IPA. If you want an even more fermentable wort than the one described above, a step infusion mash with a rest around 145 °F (63 °C) for 20–30 minutes, followed by a rest at 152–156 °F (67–69 °C) for 30–40 minutes should do the trick. The longer you spend at the low-temperature rest, the less time you need at the high-temperature rest. Although IPA worts start at higher gravities than pale ales, you still want the final gravity to ideally be around 1.012 for the hoppiest examples. (The BJCP gives 1.010–1.018 as the acceptable range.) The increase in attenuation should come from a combination of grist composition (less crystal malt) and wort production (mash at a lower temperature, and perhaps for longer). For a double IPA, you move the bar one more notch up in terms of wort fermentability. Most dIPA grists contain little (under 3%) or no crystal malts. In addition, some percentage (often 5–10%, and higher in the biggest examples) of the fermentables will come from sugar. Even with the highly fermentable wort composition, you still need the right mash conditions to make the most of it. Frequently, a long (90-minute) mash at 146–148 °F (63–64 °C) is employed. Alternately, a step mash with a rest between 140–145 °F (60–63 °C) for 30–45 minutes, followed by a rest at 152–156 °F (67–69 °C) for 20–30 minutes will work well. If you can stir your mash without losing significant amounts of heat, it would be good to do so every 8 minutes or so. The grain bills and sweet wort production (producing the pre-boil wort) steps are fairly simple for all these beers. What goes on after the wort is collected and the boil starts is what really makes these beer shine. For tips on producing worts from malt extract, see the supplementary article. Sweet wort being run off into the kettle. This series will return on Monday, with a discussion of hops and hopping methods.